Marvel’s latest Star Wars crossover unites two unlikely characters, Luke Skywalker and Doctor Aphra. It’s a combination that probably shouldn’t work, but somehow does under the skillful pen of writer Kieron Gillen. More importantly, the Screaming Citadel one shot helps to fill in some of the gaps in Luke Skywalker’s path to becoming a Jedi Knight. Despite their different allegiances, the characters need each other. Luke feels the Force, but has no real training to become a Jedi. Aphra wants to unlock the power in an artifact she recovered. The irony of the situation isn’t lost on Gillen. After a grueling cantina fight (Luke can’t seem to avoid them), he accuses Aphra of being evil. “Evil is a very strong word,” she replies. 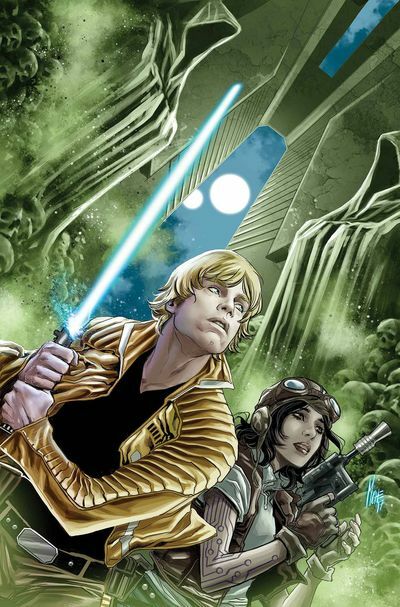 Aphra convinces Luke to accompany her to the Screaming Citadel to unlock the mystery of her artifact – and to get him the training he desperately needs. However, the price the pair has to pay for that knowledge is could end up being too high. Artist Marco Checchetto gets to play with lots of Star Wars toys in this premiere issue. Checchetto has no problem drawing Wookies, Twi’leks, Toydarians, and even a Gungun (though hopefully not Jar Jar Binks). Our favorite characters, including Leia and Luke, are easily recognizable, right down to the smirk on Han Solo’s face. Despite the dire circumstances, Gillen keeps the mood light with his irreverent characters, including Doctor Aphra and her two droids. Where R2-D2 and C-3PO frequently save the heroes lives, Aphra’s abominations gleefully plot the torture of everyone they meet. Aphra herself is a welcome change to the Star Wars universe – think of a female Han Solo with even more selfish motives. It’s also the start of a great series. Like the first issue? We’ve got the issues you need to continue the story! Star Wars: Screaming Citadel #1, Marvel Comics, Released May 10, 2017; Written by Kieron Gillen; Art by Marco Checchetto; Colors by Andres Mossa; Lettering by VC’s Joe Caramanga; $4.99. Next article Redneck #3: Slap’s dead. Cattle’s dead. BBQ shop’s in ashes.